Our Art1st Partner a Master artist-mentor program saw its culmination this April, with artist and educator Nidhi Khurana, at our studio in Lado Sarai, Delhi. 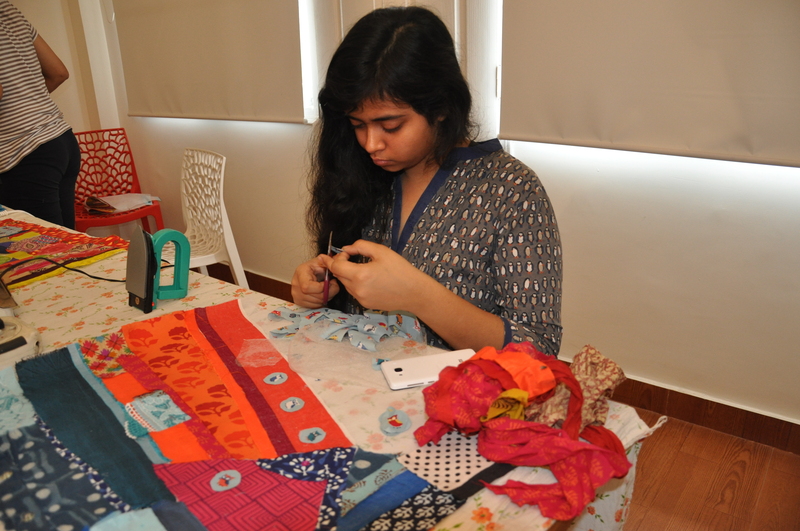 Since this was the first workshop conducted at out studio, the hive of activity had an immense air of vivacity! 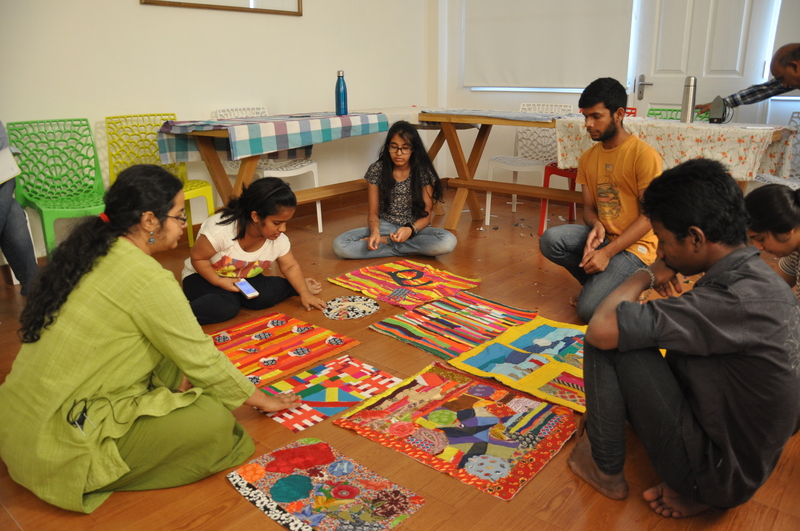 Using colour with its myriad facets including texture, use and their relationship with each other, she weaved in a tapestry of its own in the course of the two-day session with our students. They took upon themselves the artist’s own style and practice by tapping in on the tactility and augmented engagement with ‘katran’. Katran or waste/scrap cloth, collected in prior from the tailors, forged its way in terms of material exploration for our young artists. The artist’s perusal medium is essentially picking remnants of cloth and stitching them in a manner of mental mapping and inner quests, by way of making cloth murals. The session carved its own path marked by a burst of colour in the course of unraveling the very process. The colourful shreds of ‘katran’; were purposefully used by the students as part of the process of sticking them together, bit by bit, on to the pasting material and then with the help of a tailor, stitching the shreds of cloth. The concerted attempt was to make a pattern with conscious/unconscious choice of colours and invoking an assemblage of sorts, by way of a stitched/plastered cloth mural. The play of colours, inciting a range of moods, self-expression and discovery towards one’s inward explorations played through the session. It entailed working on one’s individual pieces through a process of self-discovery by the minute. The exercise required a lot of mental agility, for each one of the wisps of cloth needed meticulous ironing, pasting and stitching. 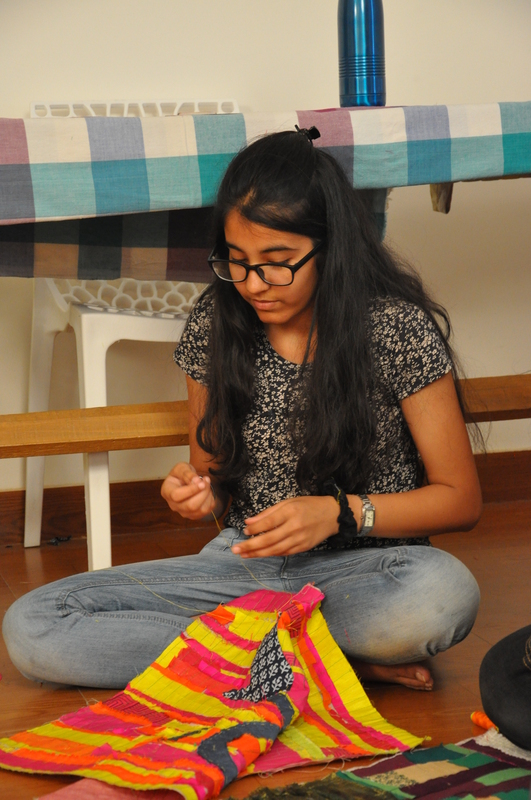 Smiha Kapoor, from Mother’s International School stated, “I loved both the experience and exposure as I have never worked with cloth before”. The session ended with a flurry of activity with each one spreading their cloth mural and talking about their pieces individually and then rummaging through to attribute a befitting title to their original piece of work! Next This is to announce our very own studio space in the heart of Delhi!